Ashley Quite Frankly: Guess What I Need? So I've been helping to promote this Hedgehog's Day thing that we're doing on my local site and I'm 97% sure that I want a hedgehog for a pet. Look how freaking cute they are! Way, way cooler than a hamster. I need one! Do they get along with chickens? Those are soooooo cute. Too bad the cat might think it was a snack. you have an award over on my blog. Go forth and be awarded. Just promise you won't name one of them Sonic. They are so cute! I want one too! Awww...very cute with a slight bit of creepiness. Not much...just a little. How old are they? They're so teeny tiny! I have one!! They are so cute and fun. Pretty easy to take care of too. They are in their cage most of the time so get along great with other pets. You can put them in a large hamster ball to let them run around the house. I say a total must have for everyone!!! E-mail or message me on my blog if you want more info!! There are probably tons of UK hedgehog websites. The Brits are obsessed with them. Oh my gosh, too cute!! just showed up in my mail box. Cutest ever! 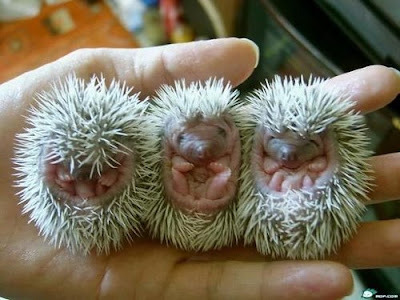 I'd name 'em all Sonic, because I'm clever/unoriginal like that. I think you'd be a great hedgehog mom. Gosh - I'm just not feelin' the hedgehog. They are a little creepy to me. I want one!!! They are too cute! You should get one so I can have one vicariously through you! And name it Sonic... although he's not blue... spray painting them could be bad though so you shouldn't do that. not that I was thinking it might be a good idea nope not at all. okay I am done now! If you get one, I am using you as my example. I've wanted one ever since I read a book about a British family who had them when I was very young. Awwww! I love hedgehogs, but they were always outside-only wildlife to me. My kiwi nana let me put out saucers of stale-bread-sopped-with-milk under my bedroom window. At night we could hear their snuffle/grunt as they trudged about, then satisfied munching once they found the food. Oh my gosh! That is the cutest thing I've ever seen. Now I want one! They look a little creepy to me flipped over on their backs. I don't know if I could handle looking at them! I could eat them up, they are so cute! OMG! You seriously need to get busy convincing Mr. Ashley! I mean how could he NOT want these cute things!!! !